In the forest just east of the Myokoji Station of Meitetsu Line, there is a temple called "Myokoji", built in Muromachi era (1348). 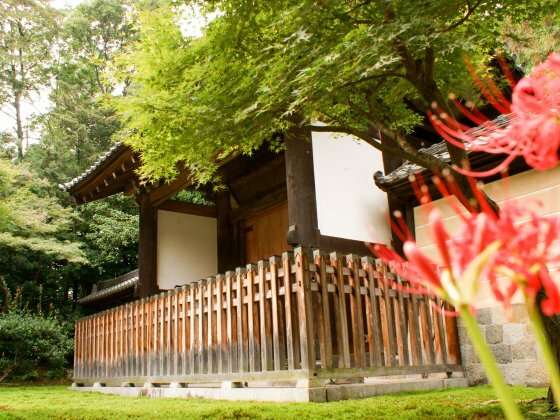 Myokoji Temple belongs to a sect of zen Buddhism led by famous Myoshinji Temple in Kyoto. The size of the Myokoji Temple is incomparable in this region. A famous strategist in Sengoku Era, Kamiizumi Nobutsuna was trained in Myokoji Temple and, this temple is said to be the origin of 'Mutodori' school of swordsmanship. Also Myokoji soba noodle, which is available even in Tokyo, has its origin in this temple. Myokoji soba had started from a recipe developed by a monk of Myokoji Temple. Although many original buildings were burnt down by repeated fire in the history, there are many impressive buildings including the Chokushi Mon Gate, which only the messengers from the imperial court can pass through. 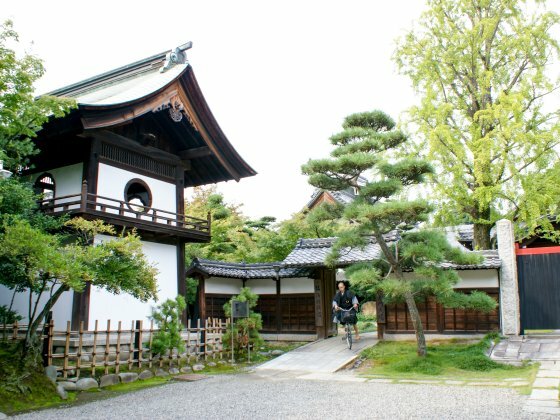 Other buildings, including the main building and a bell tower, are comparable to those of the temples in Kyoto. 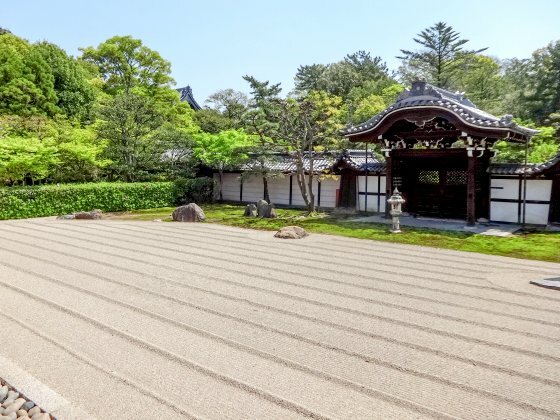 Whole area of the Myokoji Temple is registered as a cultural heritage by Aichi Prefecture. Myokoji Temple offers training for being monks of zen Buddhism, as one of a very few training temples in Japan. Apprentices get up early in the morning with the sounds of drams and bells. They do works called 'samu' everyday, meditate in zazen, and walk around through nearby farming villages for begging their daily food. 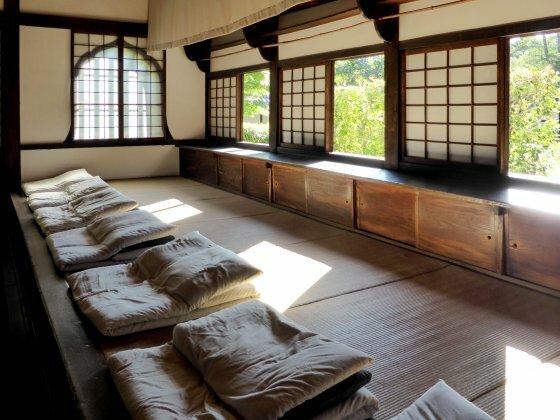 Zazen is practised several times a day throughout the year but Zazen in Myokoji is open for public on 1st and 15th every month (except 1st January and 15th August) only. It starts from from 18:00 to 20:00 in the evening with a break every 20 or so minutes. It's up to you to give up before the program ends. You practise zazen with monks. It's very hot and there are many mosquitoes in summer, and it is very cold in winter, because it's an open air place. You can observe magnificent karesansui Japanese garden in summer, however, it is already dark and you can't see it well even at 18:00 p.m. in winter. Among temple's annual events, Shukushin on January 1st, Buddha's birthday on April 8th and Parinirvana Day, which marks the death of Buddha, on February 2nd, are held in the main building (butsu den) and general public can attend. 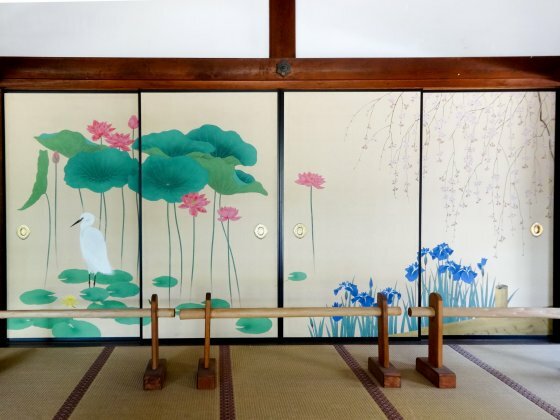 There are many cultural heritages such as old paintings, documents and artifacts, but most of them are kept in the Ichinomiya City Museum built in the compound of the temple. It's about 20 minutes train ride from Nagoya Station. Myokoji Temple is one of the largest temple in this region. Its size is comparable to famous temples in Kyoto, Nara and Kamakura. However, it is rare to see any foreign tourists here. This temple was created in 1348. This temple offer young monks to learn and practise the Zen Buddhism. The compound of the Myokoji Temple is big and it's good for walking. There are many statues and religious buildings surrounded by dense forest. The Ichinomiya City Museum exhibits the history of this region, such as the artifacts excavated from old tombs, tools and lives in middle age and old literatures. There are also treasures of the temples and shrines in Ichinomiya City. A diorama of the Myokoji Temple and surrounding villages demonstrates a scene in middle age. Around the museum building, some modern arts are also placed. On Saturdays and Sundays, the museum conducts a special programs to experience old-day spinning and weaving techniques.